The Terrace Hall is situated on the ground floor off the main corridor, near to the entrance to the Centre. The Hall is bright and airy with windows on three sides. 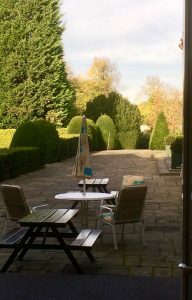 It has a lovely parquet wooden floor and a door which leads onto the terrace and the peaceful, landscaped gardens. The Terrace Hall has a capacity for 80 people. It can be set up in various ways to suit our guests’ meetings and functions. The daily cost for the hire of the Terrace Hall is £350 and can also be used as an additional breakout room for £125 per day. 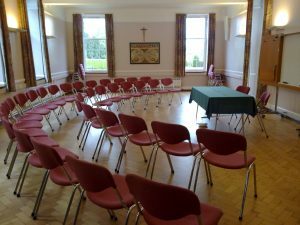 The Hall is fully accessible and benefits from a sound and hearing loop system.